Guardian, a leading manufacturer of high performance architectural glass, has introduced Guardian Sun® in the UK and Ireland, a specially coated glass with solar control and thermal insulation (U-value of 1.0 W/m²K) properties, and an internal light reflection rate of 17%, one of the lowest currently available for this type of application. 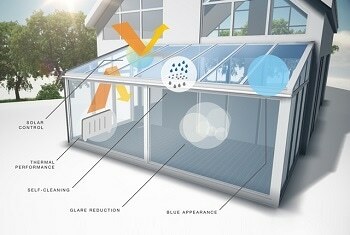 Blue for the roof will help provide a comfortable environment inside, no matter what the weather is doing outside. To learn more about Guardian conservatory glass please watch the video explaining how Guardian glass products work together helping to enjoy conservatories and orangeries all year round www.guardianglass.co.uk/conservatoryglass.